http://charlotteskitchendiary.com/tag/finola-roberts/ Now that virtually all music has an electronic component, and a home studio is just a laptop away, it’s easy to forget that electronically generated sound used to be confined to big, expensive laboratories. One such lab was the famous BBC Radiophonic Workshop, founded by Daphne Oram. Oram joined the BBC in 1943. During World War II she labored late into the night, experimenting with tape machines and other equipment. 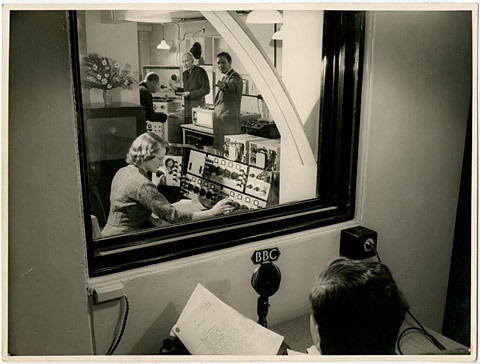 She finally convinced the BBC to open a workshop for background music and sound effects in 1958, only to leave within a year to create her own studio for pursuing a wider range of work. In the 1960s, Oram invented the Oramics machine, a device which converts drawings on film into sound. Despite her pioneering work, she was relatively unknown when she passed away in 2003. Last year, the Oramics machine went on display at the Science Museum in London. Gradually the hundreds of tapes Oram left behind are being cataloged and transferred at Goldsmiths College. The pieces in this collection are grouped by theme. The vibrating drones of “Just for You (Excerpt 1)” are followed by an experiment with reverberating vocals on “Eton,” leading to “Savage Noises (Excerpt) (1961),” which combines two similar effects for Jack Clayton’s horror film The Innocents. Soft, delicate bells on “Another Butter” (presumably for a commercial) contrast with the brittle, glassy chimes of “Wool (1967).” “Stroke” and “Shell Flight (Excerpt)” explore big, noisy, abstract sounds. Cheap Valium Australia Interspersed throughout are fascinating audio demonstrations where Oram can be heard explaining each sound. She reveals that “Hydrogen Tones” is based on the Balmer series. On “Anacin Components,” Oram describes evoking a toothache with “number eleven orange” on the Oramics machine lowered to half pitch for a “low, regular throb.” She then combines “number six orange” and “number three green” to suggest snuffling. http://charlotteskitchendiary.com/tag/burmieston/ “Oxford,” one of only two long recordings here, demonstrates Oram’s range. Electronic tones and reverberating percussive elements meander for a melancholy thirteen minutes. The result feels stunningly contemporary. “Hamlet – Youth Theatre (1963)” explore similarly deep, atmospheric territory. Also interesting is a series of surprisingly traditional Forbidden Planet style effects meant for Stanley Kubrick’s 2001: A Space Odyssey. Though short, the multi-movement “New Atlantis (1963)” is intricate and beautiful, revealing Oram’s obsession with Francis Bacon’s text (as documented by Dan Wilson in The Wire issue #330). “For Granada (1967)” anticipates Boards of Canada with its lush, wavering analog tones, while “Ursa Major (Sun Mix) (1962)” fittingly calls to mind Sun Ra. The collection ends with a charming test of a new tape recorder. According to its liner notes, this double CD, “is the result of almost two years spent trawling through the archive….” Unfortunately, due to gaps in documentation, it is more a sampler than a portrait of any given period or process. Many of the pieces here are excerpts, experiments, or “building blocks,” not intended for release or performance. Nevertheless, the collection provides many rewarding, musical moments, not to mention a fascinating window into Oram’s working methods.